Wandering. In the dark. Through a haze. Alone. My footsteps echo. Emptiness. Like a giant chamber devoid of matter. Then it flicks on. A floodlight. Now it’s not so dark. But it’s still empty. Black. A void. Only now, I have a guiding light. I wander in the dark, through a haze, alone, my footsteps echoing in the emptiness, guided by a bright light. The light grows larger, brighter, and the darkness shrinks away. Now there’s only light, but it’s still empty. That’s okay. I have a friend now. 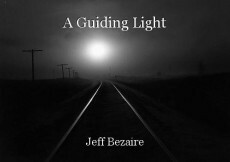 Very atmospheric, Jeff and cleverly done. Nothing's quite so scary with a friend, even one of shadow. Oh I really like this, Jeff. Nice job. Thank you most kindly, sweetheart. Nice poem, great ending too! Thank you for reading, JEF! Nice. This is hard to explain, but this felt as a very personal and intimate read. Not, from you, but reading it to myself, it seemed as if I wrote it, yes? That kind of intimate read. I like it, I like it a lot. And I like that the shadow can remind us where we've been. Thank you for reading, sweetheart. I'm happy it could spark something in you.